Do you like to look feminine on the bike? Or maybe you just want a little extra coverage? Either way, a bike skirt is a great option for looking stylish while riding your bike. A cycling skirt offers the padding of traditional bike shorts, is more feminine than baggy shorts, and offers more modesty than lycra shorts. It also looks cute at the coffee shop or the grocery store or wherever you may be stopping on your ride. Unfortunately, the big bicycle clothing manufacturers haven’t seemed to catch on that we want bike skirts! And local bike shops haven’t gotten the memo either. There are about 100 pairs of shorts for every bike skirt out there. Not to fear though, we’ve rounded up the cutest, most functional bike skirts on the market. Girl, you’re gonna love this skort. It’s comfortable, flattering, and great for bike touring. We would totally wear this skirt for biking thru wine country. The grey color hides dirt and grime well, the fabric is breathable in hot weather, and the cut is flattering on all body types. The shorts under the skirt are detachable so you can always switch out of them and into a normal pair of undies before going for a post-ride dinner. Getting in and out of this skirt is a cinch thanks to double side zippers. The fabric is stretchy without being clingy and we haven’t met a lady who didn’t think she looked good in this skirt. Like the Terry Fixie skort (below), the chamois is a little thinner than we’d like but works well for shorter rides. In fact, we like the outer skirt so much we’ve used it with other thicker chamois for longer rides. Terry is one of our favorite brands of women’s cycling clothing because they make clothes that actually look good on women! The Fixie bike skort is no exception. The slightly flared skirt is flattering, and we love the pockets. One thing to be aware of is that the chamois is a bit thin, but if you’re using the skirt for shorter rides, you’ll love it. 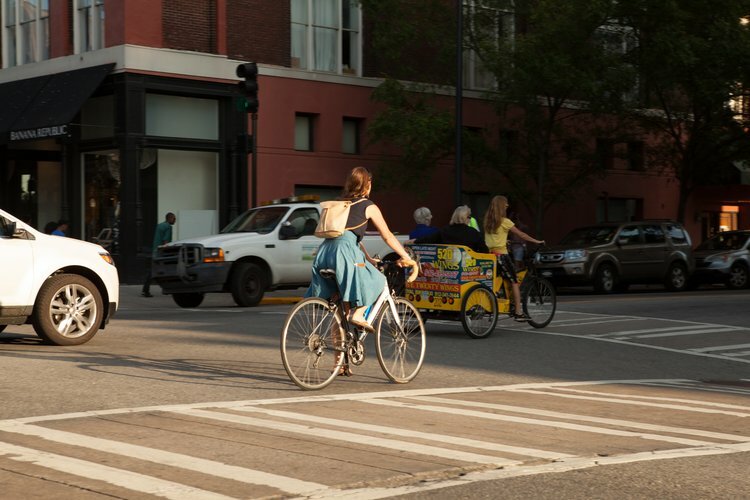 When you’re on your bike you want to focus on the right, not on adjusting your skirt. That’s why we like the Cruiser Bike Girl skirt. Grippy leg bands hold the shorts in place, a drawstring waist hold the skirt in place, and side slits provide excellent range of motion. We also like the unique pocket design–there’s on each thigh that’s just big enough for a gel, some money, or whatever else you need to stash. 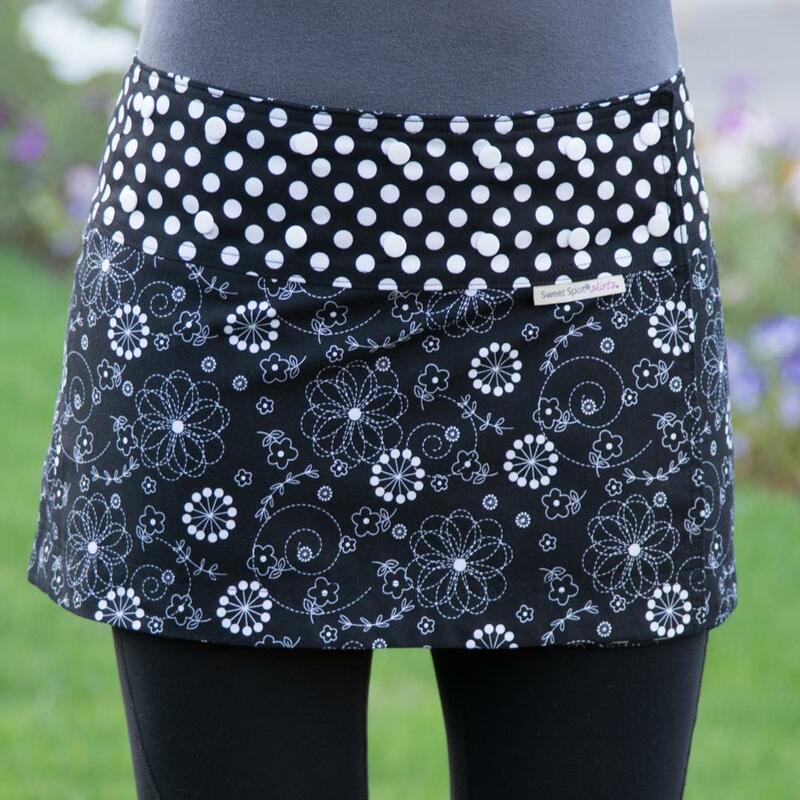 The Daisy Chain Fender skirt includes both a pair of bike shorts (that you wear under) and a skirt (that you wear over). That means if you choose to ditch the skirt one day, you can still wear the shorts. Sort of like two outfits in one! We also like that the skirt has a back pocket that’s sizable enough to hold your keys or a phone. This isn’t the skirt to wear on your next century ride, but it is the skirt to wear on your commute around town. Could this skirt be any cuter?!?! It’s also practical. It has hidden fasteners to keep the skirt from flying up (hello undies!) and external straps to keep the skirt from getting caught in your wheels. I first discovered the Sweet Spot skirts a few years ago at a women’s ride when EVERYBODY there was buying one of these skirts. Of course, I had to buy one too. This is a wrap skirt that goes over your existing bike shorts. It’s reversible with different designs on both sides, so you can get a little extra mileage out of it if you’re on a multi-day tour, for example. Due to the lack of integrated padding, it’s not my favorite skirt for on the bike, but it’s great for slipping on at the coffee shop or for your post-ride beer. We’ve compared prices, lengths, and styles to help you pick the best skirt for you.